Y’all Are the Best – Thank you! THIS JUST IN: The little man is home safe and sound. And none the worse for wear! Eyebrows? You can hardly tell the difference. A few stitches and a little groggy, but snoozing like a baby. The POTP helped him soooo much… and you know what? He didn’t even need anesthesia. Just a little painkiller. WOO HOO POTP!!!!! As you know, our little man is at Dr. Elliott’s to have a couple of things removed and tested today. We’re quite sure that the little growths are benign and nothing to worry about. We’re just being cautious and getting rid of them. To be on the safe side. Wow. The house is so quiet without him under my feet in my office. Without him rooo roo’ing for his second – or third – serving of breakfast. Without him growling at the front door (watching TV, you know) or running and barking to be let out of the back door. Back door, front door – it doesn’t matter which, I just need to get there quick and let him out! So many Scotties need the power of the paw these days, so many pooches who need the power. And so many of you know, sadly, how quiet your homes are without your loved ones with you. But, as many of you have commented lately, they never leave us. They stay with us and watch over us. Always. I just wanted to jump on the blog today to let each of you know how much you mean to our family. Your thoughts, prayers, comments, re-blogs, and especially your friendship, mean the world to us. It’s a wonderful thing when one of us needs help in Blogville, that you’re there to offer it. No matter where you are. The world is really a small place when you think about it. We’re all in this together. So, let’s Keep Calm and POTP On! 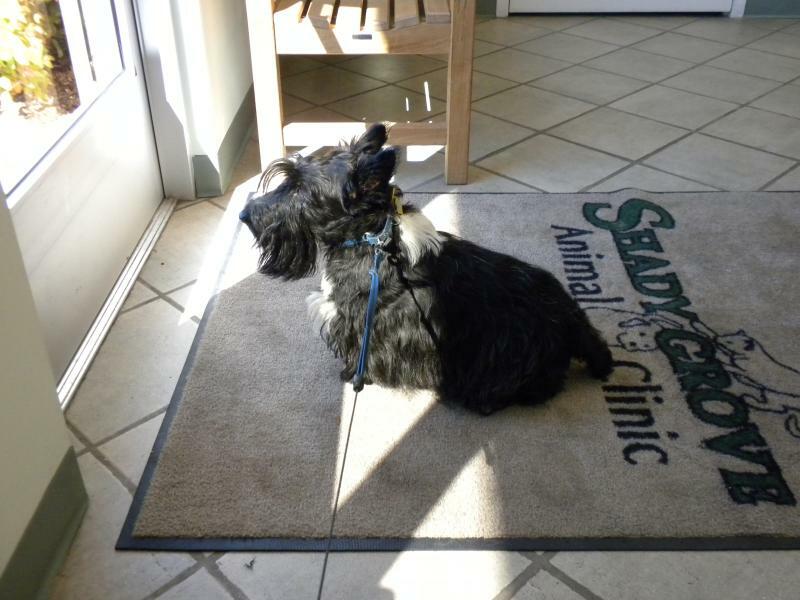 This entry was posted in dog photography, The Scottie Chronicles and tagged dogs, friendship, healing, health, illness, love, pets, prayer, Scotties, Scottish Terriers, thanks. Bookmark the permalink. 41 Responses to Y’all Are the Best – Thank you! It feels like our house is empty also without our daily dose of Stu. You did a good job, but Stu is irreplaceable. Good luck you today, my furiend! We are sending POTP that all goes well. ARRROOOO! Glad you made it through like a champ, Stu. With your eyebrow unaffected as well! Snuggle your peeps real good while you recover – it will help soothe their worries. I know Stuart will be just great. POTP for Stuart. Glad you are home and you are doing well. Bet you peeps are doing the happy dance. Thinking of Stuart today and praying everything goes well. So glad you are back home now Stuart. Why you have the rest of the day to rest up in the arms of the ones that love you. Stuart I did nothing to the squirrel in my post. He was caught by an American Bald Eagle the first Lee has ever seen. Yep the eagle caught Tree Rat and then drop him from the sky almost hitting us on our walk ~ it was terrible. Rest up buddy, pal, friend. Uh…..I think my painkiller got the best of me. I thought YOU DID it. Ugh. Being hit by a falling dead tree rat would NOT be fun. Oooops! I gotta pay more attention to what I read. Or go back to sleep. My ouchies hurt. I am sorry the ouchies hurt but it is part of the healing and let keep thinking nice warm healing thoughts. Stuart will be arooooing his thanks for you taking over his bloggy today I’m sure. Although first up when he gets home will be drink of water, snack then SNOOZE!!!! We’re keeping him in our thoughts this morning……………..and you’re right – they never do leave us but still when they aren’t there…..it’s WAY WAY too quiet! We are keeping Stuart in our thoughts today and think you did a great job speaking on his blog. Our Peeps talk to us even when we aren’t at home (groomers, spa, dogtor) so we know if you do want to say something to him, he will hear it in the dogosphere. Stuart! Get home quick! The peep will fall apart without AROOOOing in the house!! Oh boy ….. are we soooooo pleased to read this. Whatta boy. I wonder if the ‘shaved eyebrow look’ will catch on? Stuart, we are so glad things went well for you today, we will keep our pug paws crossed for a quick recovery. I just wanted to say how happy I am Stuart is doing great. I lost my Raelinn about a year and a half ago and I miss having a Scottie with me, but watching what is going on with Stuart has helped a lot. One day soon I hope to have another Scottie puppy be part of our family. I’m just waiting for the right one to find me. Thank you so much for letting me be part of Stuarts world. We depend on you to give us a wonderful picture every day and to hear your words of wisdom. We are glad that you are home safe and sound. Arrrrrrrrrrrrrrrrrrrrroooooooo! You’re home and still have an eyebrow. Dat is such a relieve. I was afraid dat I’d have to shave off one of my brows to show my solidarity. We Barkday Boys would do dat for each other. Rest up buddy and soooooo happy dat you didn’t need any anesthesia. High Paws! Glad for the update on Stuart, we don’t always make it by to comment, BUT WE SURE DO MISS OUR DAILY DOSE OF STU!………..eyebrows…….whatever, your still a Scottie, thats what matters. Can’t wait to hear your words on this, sleep good buddy! Hip, hip Arrrooooooo, from us. We’re so glad he’s home and everything is okay…’specially the eyebrows. Even missing one pup here, quietens the others….so unnatural. So glad to hear the good news! William Wallace would be so proud of your bravery. We were all set to paraphrase him by saying “They may take my eyebrows, but they’ll never take my dignity. Stuart gu bra!” But not necessary as you soldiered on with minimal scars. Go get some rest and take care. Me and my Peep are doing the Happy Dance over the good news about Stuart! It won’t be long before he wakes up, groggy, and wants to look in the mirror at his eyebrow! Please tell him we prayed long and hard today for all of you and know the results will be just fine. You have done a terrific job blogging for him today! He’ll be so proud of you. We consider Stuart and his Peeps like family and enjoy being a small part of your daily lives! Glad to hear everything went well at the dogtors, Stu! So happy to hear from your sweet peep-mommy! We have kept you in our thoughts and prayers! Rest and relax and your owies will soon get better, and you can go back and make some roo-roos and noise for your peeps! Hey buddy! Glad you are ok! Get some cheese with your meds…it helps like it does with me!! So glad to hear that all went well today…and best of all, it’s over!! Now just waiting to hear that the nasty thing was Nothing. At. All. Make sure those peeps give you lots of treats to make up for all that trauma. And make sure to give them lots of Scottie kisses for all THEIR trauma!! Glad to hear you are home and doing well Stuart! StuMom you did a suburb job with the blog today! Please give our favorite Scottie Man a big hug for us! Phew. Glad to know the happy positive updates. WeScotties are truly the best. just sleep a bit little Stuart…. take your meds…and be your sweet self in a couple of days. you have wonderful peeps that love you (we all do tho) and take the best care of little you as possible. Thats what Blogville is all about!! You take care and rest ok Stuart? So pleased to hear he is back with you safe and sound! You tell him I say he has to take it easy until he is back up to full strength! A beautiful post! So SO happy that all is well and Stuart was as brave as a pup could be! The time when they are away from us like that is just awful, I prescribe lots of hugs to the both of you! You did great!